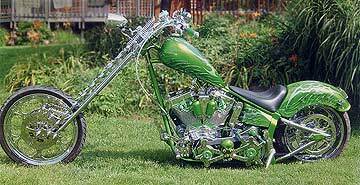 We have painted and built just about everything including guitars, boats, telephone booths, refrigerators & bicycles, but the bulk of our work is done on motorcycles and hot rods. We design each paint job for each bike, with the customer's ideas, preferences, and BUDGET in mind. From time to time we hear from customers with paintwork of ours that is over ten years old, they tell me, the paint still looks great. Over the past 30 years our customers have taken home many Best Paint awards at sanctioned International Show Car events around the country, including a record, 3 peoples choice awards In a row at the Philadelphia show and 4 in Baltimore. The attention to detail attests to the many years of having our work judged at top shows across the country. 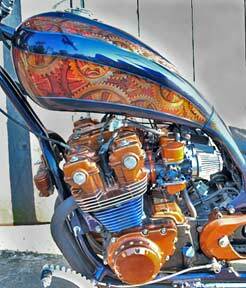 We paint all kinds of bikes, from dressers to street customs. If you don't want to completely repaint your stock HD or other brand of stock bike, but want to give it a little something to make it stand out from the rest without breaking the bank. In The Weeds Paint Works can add murals, flames or graphics to your stock paint, then re-clear it to freshen it up into a hole new look. We paint hot rods and cars too! Attention owners of 100th Anniversary Harleys! Want to spice up your paint without changing it too much?, We can layer some candy blue over the stock color and add some ghost flames or graphics to set your bike apart from all the rest. We have lots of ideas for all those Anniversary bikes out there. Prices run $1000-1500.